Nowadays, a lot of people may have already used logistics and shipping companies for delivery once or twice in their lives, may it be for sending gifts, for businesses, and for house-moving. Although there are a lot of logistics providers offering services to people, finding one that lives up to its promise of giving a fast courier service is a problem. Some delivery companies’ shipping duration takes days. But with Transportify’s, everyone is sure to benefit from the convenience of our express delivery service. Small business owners can definitely benefit from the fast courier services of Transportify. You do not need to go through all the actual trouble of renting vans or trucks because booking through our app or website is just one click away. Same-day deliveries for rushed orders are even possible to suit your customers’ urgent needs. Moreover, you can track the movement of your packages so you can ensure your valued customers that their packages are on the way. More and more Filipinos are shifting to online marketplaces like Lazada and Shopee. Thus, it is a challenge for online shops sellers to keep up with the delivery demands brought about by the growing number of buyers. With Transportify’s fast delivery service, online sellers can avoid delivery delays that can cost them their current and prospective buyers’ trust. If you are worried about the speed of our delivery may damage your products, then worry not. We can assure you that all Transportify delivery vehicles are in good condition and are capable of carrying heavy large items like furniture and appliances. Filipinos know how tedious house-moving can be—searching for the most affordable moving truck for rent, finding the best day to move out, and so on. Back then, it takes a long while for families to move houses. But now, with Transportify available for mobile downloads, people can find affordable moving trucks in a minute and schedule a house-moving even on the same day! You will be able to move out of your old house and move into your new one immediately. Plus, you can track the location of our drivers along with your packages and the estimated time of arrival. No more worrying when will your furniture get to your new house and no more worrying if your personal belongings got lost. Special occasions like weddings and formal parties can also benefit from Transportify’s fast courier service. Transporting homemade centerpieces, decorations, and props are now hassle-free. You can simply book a nearby van or schedule a pick-up in advance, and then sit back and watch as we deliver your packages within the day. You will have more time preparing for the event instead of panicking and wondering when the decorations will arrive. Our express delivery services are also applicable to team buildings and company outings. Transporting tables, chairs, and even food are no longer a problem. With Transportify, you can always expect your package to get there on time and in excellent condition. 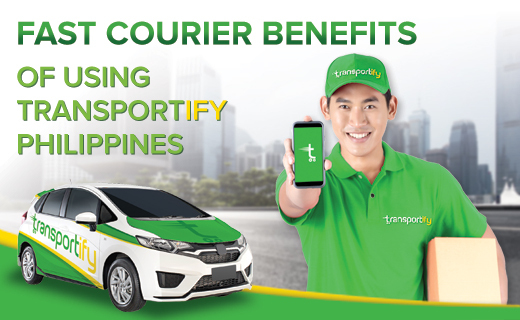 Transportify is truly helpful for everyone who is looking for a reliable fast courier here in the Philippines. Our valued customers can always expect our quality service in express delivery.